Headline: "Settlers renewed their invasions of the Al-Aqsa Mosque and Regev invaded the Old City"
"Israeli Minister of Culture and Sport extremist Miri Regev invaded the Old City of occupied Jerusalem yesterday [Jan. 27, 2019] and carried out a provocative tour under increased security protection. 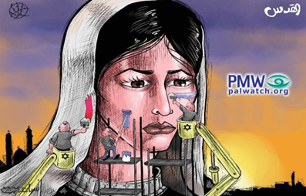 Regev is known for her racist and extremist viewpoints against our people, and is considered one of the leaders in calling for the establishment of the alleged 'Third Temple' in place of the Al-Aqsa Mosque." Headline: "The occupation police chief and several ‘veterans’ invaded the Al-Aqsa Mosque"
In conjunction, the occupation government's [Israeli] Minister of Public Security extremist Gilad Erdan sent a letter to the alleged Temple groups in which he congratulated them on the publication of a religious book that permits invading the Al-Aqsa Mosque." Headline: "35 settlers invade the Al-Aqsa Mosque"
"Settlers carried out provocative rapid tours at the Al-Aqsa Mosque and listened to explanations about the alleged Temple." 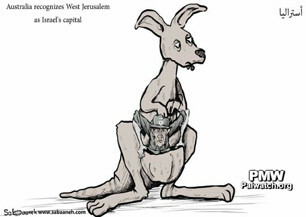 The cartoon shows a kangaroo with an Israeli soldier – depicted by a Star of David on his helmet – in its pouch. Australia recognized “West Jerusalem” as Israel’s capital on Dec. 15, 2018. Australian Prime Minister Scott Morrison announced the move in a speech, saying: “The Australian government has decided that Australia now recognizes [that] West Jerusalem, as the seat of the Knesset and many of the institutions of government, is the capital of Israel.” Morrison also said Australia will recognize “East Jerusalem” as the capital of a future state of “Palestine” following a peace deal. PLO official responding to Australian recognition of West Jerusalem as Israel’s capital: “No part of [Jerusalem] can be recognized as Israel’s capital"